The IGF-1 test measures the IGF-1 blood level. This IGF-1 lab test helps evaluate growth hormone production. What is an IGF-1 test? The IGF-1 test measures the IGF-1 blood level. Why is an IGF-1 blood test important? This IGF-1 lab test checks for IGF-1 deficiencies or excess IGF-1 levels. This IGF-1 Test is a blood test. This IGF test, sometimes known as an IGF lab test, IGF-1 blood test, insulin-like growth factor test, and somatomedin C test, measures the IGF-1 blood level. IGF-1 is a protein and a hormone primarily produced by the liver. As the name suggests, IGF-1 is involved with different processes involving the growth of tissues, muscle and bones in the body. IGF-1 levels increase when production is stimulated by the presence of growth hormone (GH) but levels can also increase with large amounts of protein in the diet. IGF blood hormone levels are particularly high during puberty when rapid growth is occurring in the body and tissues. Similar to insulin in structure, IGF-1 levels are measured to help evaluate growth hormone level deficiencies such as hypopituitarism or growth hormone excesses such as acromegaly. In rarer cases, IGF blood levels might be lower because of a poor diet which can be corrected with adequate nutritional intake. Deficiencies of IGF-1 can cause growth retardation. In contrast to growth hormone levels which vary throughout the day, IGF blood levels are relatively stable throughout the day. As a result, IGF blood testing is often performed in conjunction with growth hormone testing as it serves as a useful proxy for understanding one's average GH levels. IGF-1 is carried around the bloodstream by IGFBP-3 and some also get the IGFBP-3 test at the same time as the IGF-1 test to understand how well their IGF-1 is being transported around the body. The IGF test requires a simple blood draw. To get an IGF test near you, order online and get tested at a local Quest Diagnostics lab. Once the IGF lab results are ready, they will be downloadable. 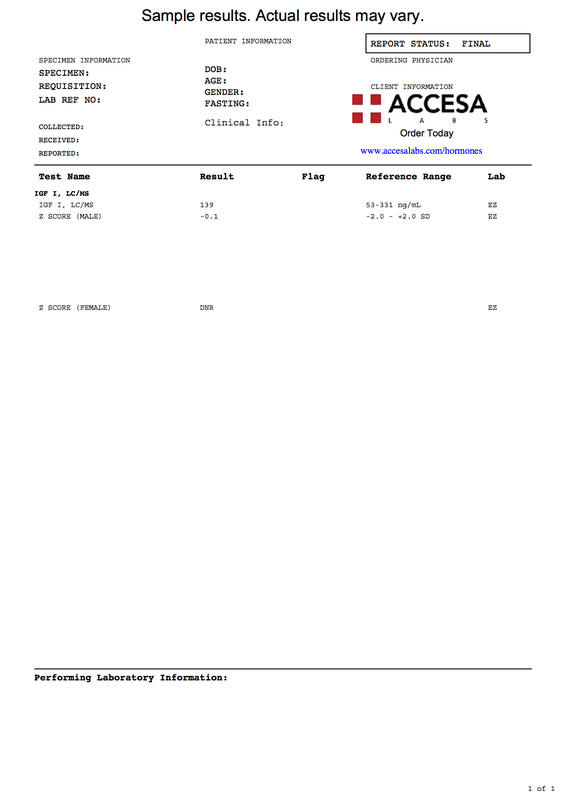 As can be seen on the sample IGF 1 lab report, IGF-1 blood levels are reported as a number and can be compared against the reference range provided by the lab. No fasting is required for the IGF-1 blood test unless other tests done concurrently require that fasting be performed. IGF-1 Test at Guaranteed Prices.